The St. James Court fountain – the center of it all. I wanted to give a quick shout out to the annual St. James Court Art Show, which had a tremendous turnout two weeks back with over 300,000 attendees enjoying the weather, food and art. In its 56th year of existence, this is one of the largest and most recognized art and craft shows in the country, and for me signifies that fall has truly arrived. The start of the football season and the baseball playoffs are other indicators, but St. James means the leaves are turning and I’ll need a sweater soon. I don’t get into downtown Louisville all that often and this show is a great excuse to wander one of the city’s classic old neighborhoods with thousands of like-minded folks. 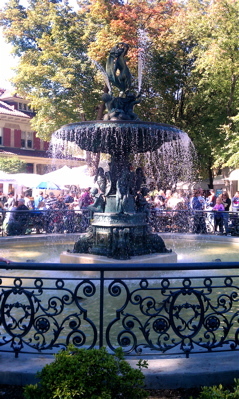 The St. James Court neighborhood has been around since 1887, and its centerpiece, like the art show’s, is the fountain. If you have to meet anyone, tell them to find you at the fountain, which was imported from England in 1895. 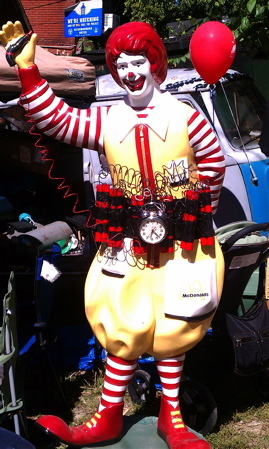 Ronald McDonald strapped for destruction. I’m sure this is making some statement about corporate greed, or spinning it on its head. The St. James Art Show brings out an edgier sense of humor. The show itself started in 1957, consisting of 15 exhibitors who paid a 50 cent entrance fee and showed their art works hung upon a clothesline. Today there are upwards of 750 exhibitors. The number of booths can make your head spin. I take paper and pen to notate artists of interest, or items tempting enough I want to return for a second look before making my final purchases. This year organizers have a smartphone app, including Google Map, to help folks find specific booths and artists. Simply go on the art show’s Web site and search under “Booth Maps” to find details about the artists and their locations. There are ceramics, woodwork, hats, leather-ware, photography, custom clothing, sculptures, paintings, ironwork – you name it, they have it. The most expensive item this year was a lion sculpture priced at $20,000. The St. James Court Art Show is produced in collaboration with five neighborhoods and the West End Baptist Church in Old Louisville, on St. James and Belgravia courts, Magnolia Avenue and Third and Fourth Streets. Hours: Friday and Saturday 10:00 a.m. – 6:00 p.m.; Sunday 10:00 a.m. – 5:00 p.m. This entry was posted in Events, Travel and tagged Louisville, St. James Court Art Show. Bookmark the permalink.